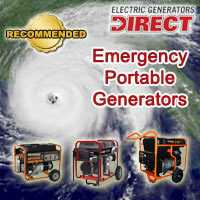 Electric Generators Direct Lists Best Portable Emergency Generators. Top Rated Portable Emergency Generators Recommended. To officially kick off the start of hurricane season, ElectricGeneratorsDirect.com announced today their recommendations for portable emergency generators. After the storm hits, you want to know that the generator your buying is going to last out the power outage. Electric Generators Direct gives consumers honest, straight-forward recommendations. ElectricGeneratorsDirect.com, however, isn't your ordinary retailer. The online superstore specializes exclusively in electric generators and carries more than 150 types of emergency generators from over a half-dozen leading brands. Once the dust and data settled, 3 medium portable emergency generators, 3 large portable emergency generators and 3 x-large portable emergency generators, sold by ElectricGeneratorsDirect.com were given their prestigious "Recommended" status. In addition, Hoch personally wrote online reviews for each portable emergency generator, explaining why the company recommended it. By providing the recommendations and reviews, ElectricGeneratorsDirect.com hopes to arm shoppers with enough ammunition to pick the perfect portable emergency generator for their needs. Power Equipment Direct operates nine niche online superstores. In addition to ElectricGeneratorsDirect.com, the Bolingbrook, IL-based company operates AirCompressorsDirect.com, PressureWashersDirect.com, SnowBlowersDirect.com, MowersDirect.com, WaterPumpsDirect.com, SumpPumpsDirect.com, ChainSawsDirect.com and LogSplittersDirect.com.